3.6 out of 5 based on 28 bloggers and 6 commenters. 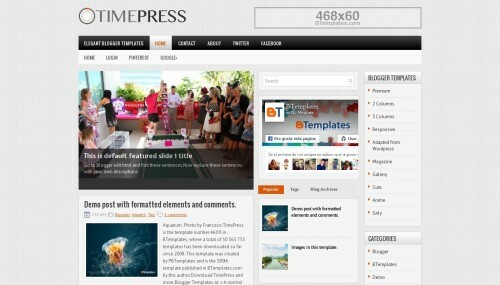 TimePress is a free blogger template adapted from WordPress with 3 columns, responsive design, magazine-styled, seo friendly, right sidebar, ads ready, footer columns, slider, posts thumbnails, tabs, breadcrumbs, a background pattern, 404 error page customized and neutral colors. Excellent template for blogs about any general topic or news. I already tried to change it to 10 posts in “Posting Blog Setting”, but it still nothing changed. Thank you for helping me. I love this template but how to change feature slider photos?